Info Wayne County Sheriff Warren Evans is one of the state's leading criminal justice professionals, having held a broad range of positions in the field over the past 35 years, including his first 20 years within the Sheriff's Office. He has served as a police officer, correctional officer, supervisor, manager and administrator. He also has held executive positions in law enforcement, adult corrections, community corrections, juvenile detention, juvenile training schools and community based programs. 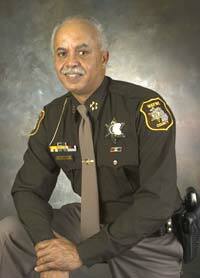 Prior to becoming Sheriff in January 2003, Evans served for two years as Chief of Special Operations at the Wayne County Prosecutor's Office. His areas of responsibility included the prosecutor's Juvenile Division, Police Shooting Investigations, Major Drug Prosecutions, Drug House Unit and Auto Theft. A life-long Detroit resident, Evans has held every rank within the Sheriff's Office, starting as a Deputy in 1970 and eventually serving as Undersheriff to Sheriff Robert Ficano from 1987-1991. In 1978, Evans became the department's youngest-ever lieutenant at age 28. During his tenure at the department, Evans also served as Director for the two county jails in downtown Detroit. Evans was recruited by Wayne County Executive Ed McNamara to create and run the Department of Community Justice. While in that position, Evans oversaw the planning of a new Juvenile Detention Facility and many of the reforms that have led the U.S. Justice Department to hail the once-troubled facility as national model for its innovative programming and effectiveness in dealing with troubled youths. After a brief hiatus from county employment, Evans was named Chief of Operations for the Wayne County Prosecutor’s Office in 2001, where he led the auto theft, juvenile, drug house and abandoned building units. Since becoming sheriff in January of 2003, Evans has initiated several new crime reduction partnerships with city and suburban police chiefs. They include an unprecedented collaboration with the city of Detroit Police Department to double the number of officers on the streets tracking down felony fugitives that has resulted in more than 12,000 arrests in four years – a tripling of the number of adult felony fugitives arrested on a daily basis. While many other police agencies across the state are laying off officers, Evans has actually been able to hire additional officers by securing numerous grants and contracts for police service. Examples include the Sheriff’s patrol of Detroit Department of Transportation buses and routes, entry security at the county’s civil and criminal court buildings, as well as innovative units such as the Missing & Exploited Children’s Task Force and the Spot Check unit, which make unannounced visits to the homes of parolees and probationers to make sure they are more strictly supervised. Evans is proud to have developed a Sheriff’s Office that is responsive to the needs of local police departments by providing specialized services on a regional basis, such as Internet crime investigations, fugitive apprehension, auto theft investigations, prisoner transportation and more.